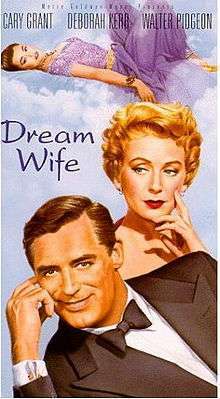 Dream Wife is a 1953 romantic comedy film starring Cary Grant and Deborah Kerr made by Metro-Goldwyn-Mayer. It was directed by Sidney Sheldon and produced by Dore Schary, from a screenplay by Herbert Baker, Alfred Lewis Levitt and Sidney Sheldon. The music score was by Conrad Salinger, the cinematography by Milton R. Krasner and the art direction by Daniel B. Cathcart and Cedric Gibbons. The costume design by Herschel McCoy and Helen Rose received an Oscar nomination. The film's secondary stars included Walter Pidgeon and Betta St. John, with supporting performances by Eduard Franz, Buddy Baer, Richard Anderson, Dan Tobin, Dean Miller, and Movita. The character of "Princess Tarji" was slightly resurrected in one of Sheldon's I Dream of Jeannie TV episodes, "This Is Murder" (4/9/66), portrayed by Gila Golan. Shortly after the release of this film, Cary Grant went into a self-imposed retirement from acting, subsequently turning down many film offers including Sabrina, in which he would have co-starred with Audrey Hepburn and A Star Is Born with Judy Garland. In 1955, director Alfred Hitchcock persuaded Grant to return to films with his classic thriller To Catch a Thief. Businessman Clemson Reade (Cary Grant) breaks his engagement with workaholic U.S. diplomat girlfriend Effie (Deborah Kerr) for an adoring "old-fashioned" girl from the fictional country of Bukistan, Princess Tarji (Betta St. John). Reade wants a wife who can "just find having babies and taking care of a man" pleasurable. While Reade tries to get closer to his bride-to-be, Effie, who has been assigned by the State Department to see that the marriage does not disturb a major oil deal with Bukistan, ends up educating the Princess about such Western ideas of the role of a wife and women's emancipation, while, simultaneously moderating some of her own ideas about making the happiness of her "man" (i.e. Grant) a primary concern. Grant's courtship of the Princess, which he attempts to conduct by "American" customs, must be adjusted to Bukistanian tradition, to protect the proposed oil deal. Effie explains to him that the marriage, called "hufi", is followed by a prolonged period of celebration called "bruchah". These terms are borrowed for comedic effect from the Jewish terms "huppah"—the canopy beneath which the marriage ceremony takes place (thus the ceremony itself is sometimes called "hupah") and "Sheva 'bruchis' or 'sheva brachot'" - 7 blessings ("bruchah" means "blessing", in the Ashkenazic pronunciation) that are recited as part of both the ceremony and a week-long celebration that follows. According to MGM records the film earned $1,213,000 in the US and Canada and $672,000 elsewhere meaning it resulted in a loss of $456,000.